Sharing | A Mirror of My Thoughts! 2. You try and reuse gift wrappers, gift boxes, and of course aluminum foil. 3. You are Always standing next to the two largest size suitcases at the Airport. 4. You arrive one or two hours late to a party – and think it’s normal. 5. You peel the stamps off letters that the Postal Service missed to stamp. 6. You recycle Wedding Gifts , Birthday Gifts and Anniversary Gifts. 8. All your children have pet names, which sound nowhere close to their real names. 10. You talk for an hour at the front door when leaving someone’s house. 11. You load up the family car with as many people as possible. 12. You use plastic to cover anything new in your house whether it’s the remote control, VCR, carpet or new couch. 13. Your parents tell you not to care what your friends think, but they won’t let you do certain things because of what the other “Uncles and Aunties” will think. 14. You buy and display crockery, which is never used , as it is for special occasions, which never happen. 17. You keep leftover food in your fridge in as many numbers of bowls as possible. 22. You live with your parents and you are 40 years old. (And they prefer it that way). 23. You don’t use measuring cups when cooking. 25. You can only travel if there are 5 persons at least to see you off or receive you whether you are traveling by bus, train or plane. 26. If she is NOT your daughter, you always take interest in knowing whose daughter has run with whose son and feel proud to spread it at the velocity of more than the speed of light. 27. You only make long distance calls after 11 p.m.
28. If you don’t live at home, when your parents call, they ask if you’ve eaten, even if it’s midnight. 29. You call an older person you never met before Uncle or Aunty. 30. When your parents meet strangers and talk for a few minutes, you discover you’re talking to a distant cousin. 31. Your parents don’t realize phone connections to foreign countries have improved in the last two decades, and still scream at the top of their lungs when making foreign calls. 32. You have bed sheets on your sofas so as to keep them from getting dirty. 33. It’s embarrassing if your wedding has less than 600 people. Why Men Don’t Write Advice Columns.. I hope you can help me here. The other day I set off for work leaving my husband in the house watching the TV as usual. I hadn’t gone more than a mile down the road when my engine conked out and the car shuddered to halt. I walked back home to get my husband’s help. When I got home couldn’t believe my eyes. He was in the bedroom with a neighbor lady. I am 32, my husband is 34 and we have been married for Twelve years. When I confronted him, he broke down and admitted that he’d been having an affair for the past six months. I told him to stop or I would leave him. He was let go from his job six months ago and he says he has been feeling increasingly depressed and worthless. I love him very much, but ever since I gave him the ultimatum he has become increasingly distant. I don’t feel I can get through to him anymore. A car stalling after being driven a short distance can be caused by a variety of faults with the engine. Start by checking that there is no debris in the fuel line. If it is clear, check the jubilee clips holding the vacuum pipes onto the inlet manifold. If none of these solves the problem, it could be that the fuel pump itself is faulty, causing low delivery pressure to the carburetor float chamber. Dunno why my heart longs for this from the loved ones today. A real chilled morning and I can feel the cold seeping into my soul somehow. I dream of being perfect in everything I do, trying to put a piece of my soul in every activity. Sometimes, it feels so close, that can I become that little Ms. Perfect. Yet, if I have to be totally realistic, I would like to be really good in everything I ever did or do. And for what sake? To be loved a little more.. Is it what am looking for? A little greed doesn’t hurt anyone, does it? Am just back from a little crib session and this was a hot topic there. How surprising it is to see this issue popping up in so many conversations. Credit Sharing is an important aspect of managing any team structure and I am sad to see many ignore it in their way to glory. I am not trying to bring in Ayn Rand philosophy of selfishness here as in the current organizational context, in Indian industry, we work with people and the more we grow in our career, the more our success is dependent on the inputs and support offered by the others. Especially in IT industry, where a lot of work is structured around groups and teams, it is even ridiculous to ascribe the credit to a single person in the success of a project. Yet, I see this phenomenon of credit snatching and credit hiding instead of credit sharing. I don’t see any logic in blaming team for failure and appreciating manager for success. In fact, some of the best leaders I have met in the industry are successful in their career are those who realize the potential of the people working for them and put it to effective use by aiding to their professional and personal growth. Though I hear some say that don’t mix up emotions in professional life, how can it be possible that we are emotionally insensitive to the people around us? I can sense that people follow leaders, not the rule books. Please be the guiding hand to those you work with, making sure that they don’t need anything instead of dictating their lives and taking credit for their efforts. A little bit of recognition can do wonders for motivation levels and the work environment. And all those entry level people, it also means acknowledging the existence of the security personnel or those receptionists instead of treating them like pieces of furniture. A little pat on the back, a gentle smile or a small nod can do wonders, trust me. I have shouted this over phone and my friend couldn’t stop giggling.. Sounds a little quirky, isn’t it? Well, who can get a rainbow of their own, by the way? There is a little story behind it. I was trying to change the header of my blog on Saturday. (Oh yeah, I had a lot of time to kill 😉 ) The earlier one has little kids soaking up rain with little umbrellas and now I wanted a new look..
After doing a little hunt, I hit upon the current picture. It looked a little plain and I wanted to add a splash of a rainbow. So here a little confession follows.. I have always loved rainbow ever since I discovered its beauty in wilderness as a little kid. Such splash of myriad hues each conveying a different warmth in the huge expanse of sky filled my eyes in wonder.. They is such a rare joy in capturing one that I conjured this belief that it appeared when God smiled to his heart’s content. In fact one of my nicks is Iris. I went all around the Web to steal a rainbow for this pic. 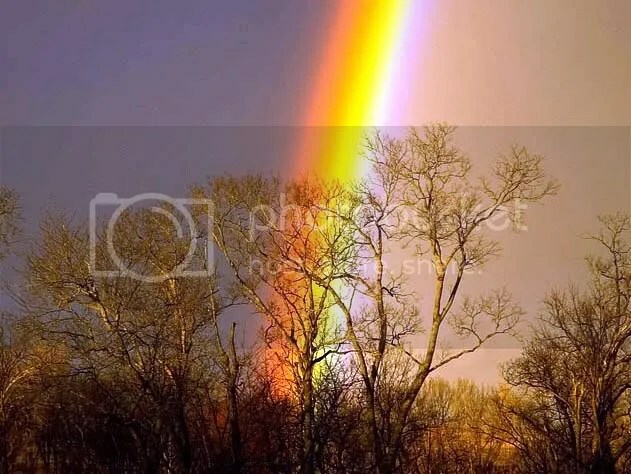 As I didn’t have Photoshop, I worked on MS PowerPoint 2007, and tweaked the picture edit tools to soften the edges of a rainbow and grouped it with the other image. And when it worked and my header is glowing in all splendor is when I yelled, hey I got my rainbow, following it up with a hearty giggle in a dash of madness! Am glad that I had a friend to share it over the phone.. Happiness looks so small when I hold it in my heart, it’s when I share it that I realize its breadth.. I thought I would record that little touch of joy and that Eureka moment @ demand of that pal who shared my fun. This is a very special festival in both family and cultural aspects as never a year rolled by when I haven’t prayed Ganesha in this occasion. Ganesha is one of my favorite Gods, as he is so much malleable to creativity. He get the first prayers as he is the one who guides opportunities by eradicating the obstacles. (So as the mythology goes). This is an old forward, yet it was so current in my memory that I hunted it down to share it with you all. I celebrated this year with my family friends and as I was enjoying the puja it struck me how much these rituals create the bonding of being together with the family. Whenever this festival arrives and wraps me in a humdrum of activity, I cant help but take a trip down the memory lane.. Reliving all those days of hectic shopping for the idol and flowers, Troubling Mamma for new books, Drawing Om on the book covers, Setting up the Mandapa, Dressing up in new clothes, The humdrum in the kitchen, Chanting of the sloka, Ardent avoiding of the moon and so on.. All those moments flash live they are still alive and are happening now. Sometimes somethings sound plain stupid to the naked eye, yet they have a lot of depth behind it. The entire personification of God and treating him with flowers, dressing him up, and offering food in a particular process may sound tiring and ridiculous, yet I love the effect of peace it creates in the mind, the feeling of unity in entire family helping each other in getting things done, and the visits of the relatives and friends and the community bonding.. Sometimes I feel as if there is a meaning behind everything and everything has a meaning.. It may be hazy to figure it out in an instance yet, it doesn’t stop me from believing. These rituals are just not about religious beliefs, they are about uniting everyone under simple purpose and activity, and sharing common memories through procedures and protocols. How much I love them! I noticed this magnificent beauty on Besant Nagar roads yesterday. Its such a visual treat to watch such a splendid display of yellow, as if it stood to rain energy and warmth on the inviting land assuring one of the alluring things that are going to come. As Chennai gears up to receive monsoon, I hope there will be more such lovely dash of colors to come. Guess I did an OK job in capturing it, for the ethereal experience I had watching this couldn’t be represented in this paler photograph. Still I tried! By the way, does anyone know the name of this tree?